Please help! I need to get this lapot working for a trip I am taking. How big is the hard drive/partition? There is more information on the screen, we cant hardly do anything about it now. Please type the entire screen onto here, then we can help you. (I see something about clock speed, but there must be more information). Save to disk is a powermanagement utility (like Windows Sleep). 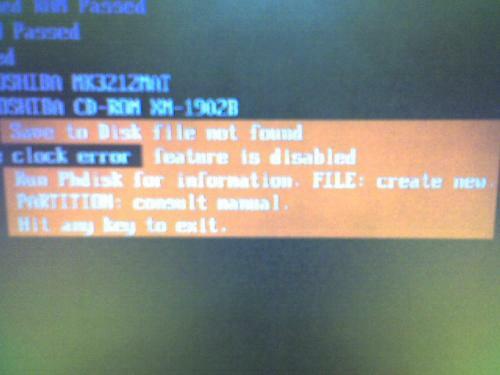 This error occours when your system memory has increased or your save to disk partition cannot be found. 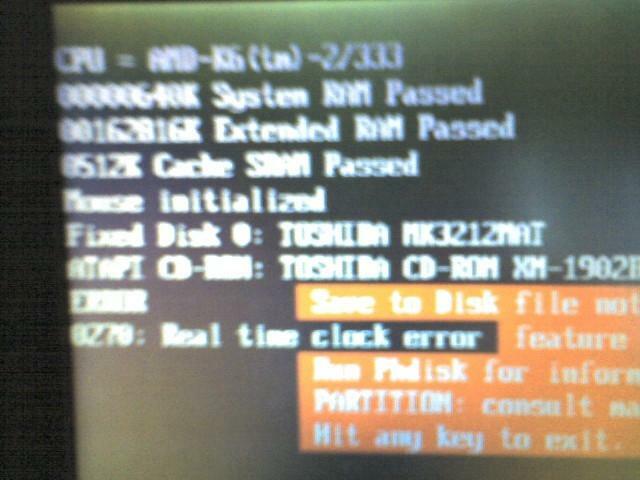 Try to contact Toshiba about this. What happened to you is that your hdd was partitioned. and Toshiba used to have a Save to Disk thg. I have it on one of my toshibas. This was usefull before hybernation existed. It used to save RAM into a special partition. Since 7 installation reparts the HDD that happened. Just investigate how large the part was and repart your hdd, or disable it by entering setup. This may be easily done.